Corum has long been affiliated with artists for its legendary timepieces. Even back in the mid 1950’s when founder Rene Bannwart experimented with drilling holes into coins to create dials, and when his son Jean-Rene turned to watchmaking artists such as Vincent Calabrese for the famed Golden Bridge, this brand was on the cutting edge of blending art and watchmaking technology. Decades later, when the brand was owned by Severin Wunderman, the beloved Bubble was unveiled, and frequently incorporated artistic dials as statement makers. Recently, under today’s ownership, the brand has not only re-established is artistic Bubble, but also has brought it to new heights — turning to a host of artists for some of the most unusual dials on the market. One of them most recent unveilings is the Corum Bubble 47 Magic by Canadian artist Elisabetta Fantone. First shown to the world last month at Art Basel Miami, the Corum Bubble 47 Magical with dial by Elisabetta Fantone is the second in an artistic collaboration with the artist, who has been highly commissioned by celebs such as Muhammad Ali, Celine Dion and others for her artwork. The newest Corum Bubble 47 Magic watch transcends time and space with an astronaut on the dial in a decidedly “space odyssey” sort of recollection. 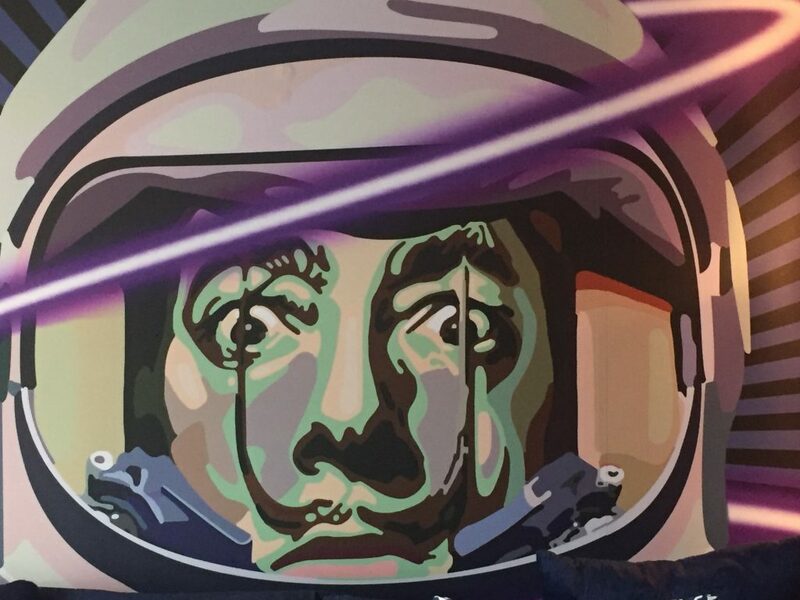 The dark green background engulfs the face of space-suited astronaut — eyes wide open — with neon orange swirling lights aglow around him. The watch has no hands, and, instead, time is indicated via a blue circle that engulfs hour and minute markers corresponding to the time. For those familiar with Fantone’s work, the brass-based dial is especially “her” – with manipulated painting and distinctive facial features. The look is made inky black and recalls deep space thanks to the black PVD grade 5 titanium case and bezel, and integrated black rubber strap. The watch retails for $6,400. 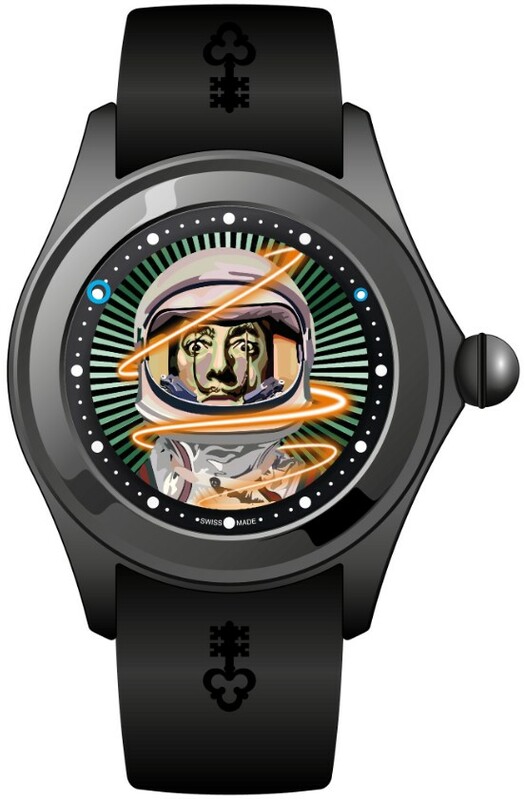 Our impressions: Even if you are not into space, astronauts and sci-fi, you will have a hard time resisting this watch — it screams adventure, action and unrivaled pop-art. As mentioned, this new watch was unveiled at Art Basel Miami, where there was a National Hotel takeover by Fantone, whose works were displayed everywhere, from the hotel lobby to the bottom of the swimming pool. 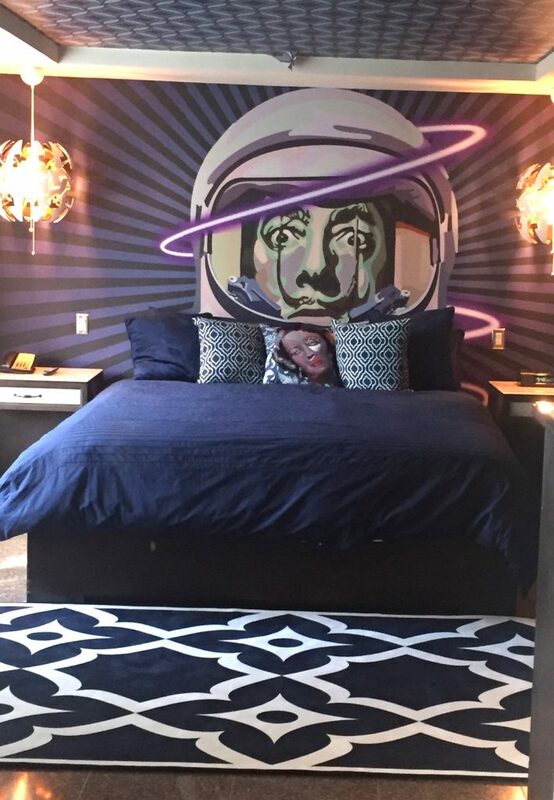 She even decorated an entire suite sponsored by Corum, wherein the painting of the watch dial was the dramatic backdrop on the wall behind the bed, and where her artwork was converted to wallpaper for the walls and fabric for the pillows and coverlet. As mentioned, this is the second affiliation that Corum has entered into with Fantone. The first Bubble Magical 47 watch Fantone crated was decidedly different, with a modern interpretation of the classic Mona Lisa. 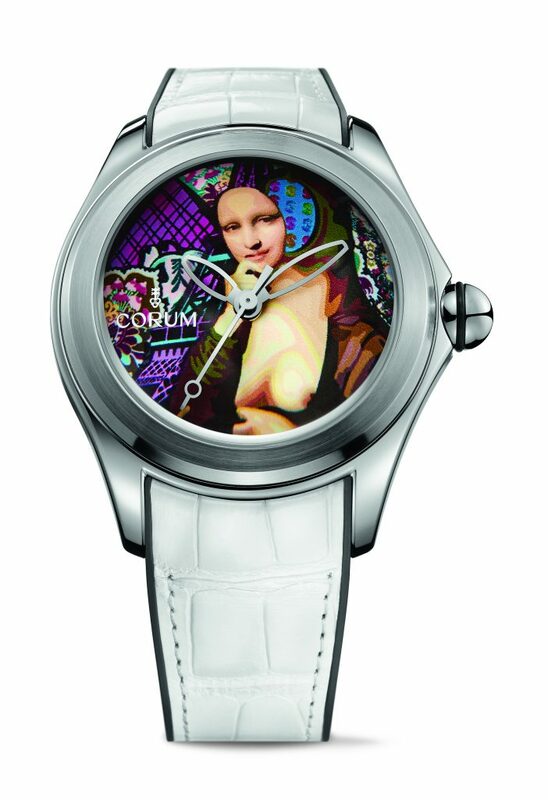 The first Corum Bubble 47 Magical watch by Fantone featured a likeness of Mona Lisa. Corum Bubble 47 Magical “spaceman” watch by Elisabetta Fantone. The dial was the central motif for the bedroom wall of the suite designed by Fantone at the National, Miami.